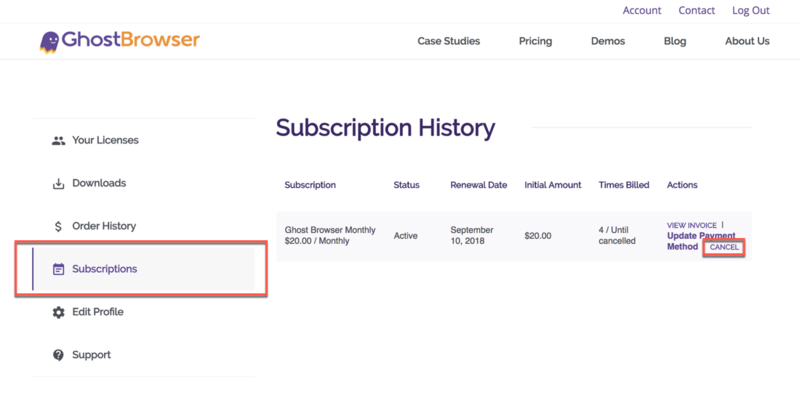 Note: If your subscription rate is lower than the current price of Ghost Browser and you cancel your subscription, you will not be able to get the same rate if you re-subscribe. Please note that deactivating a user does NOT cancel the subscription. The subscription will stay active and you can assign the license to someone else. 2. In the Subscriptions section, under the Actions column click Cancel for the subscription you want to cancel.